Who doesn’t like a quick, healthy, and delicious weeknight dinner recipe? I know, and I’ll tell you. NO ONE! This Vegetable Fried Rice with Crispy Ginger Garlic Tofu checks all of those boxes off. I make this recipe quite often…so often, I don’t use a recipe. But the last time I made it, I took the time to measure everything out and write everything down for you. Lucky you, because this is a favourite here and I hope it will be come one of yours too! What’s great about this recipe is you can use whatever vegetables you have in your fridge that would be suitable for stir-frying. Each time I make this recipe, it’s slightly different because it all depends on what vegetables I have. This particular time, I used the veggies you see above, but you can also use peppers (red, green or yellow, it doesn’t matter!) You can also add in some kale or spinach, snow peas, zucchini, baby bok choy, cauliflower, baby corn, bean sprouts…see? Whatever you have available to use is fine and whatever combo you end up with will be delicious. Just be sure to adjust cooking times appropriately since some vegetable cook quicker than others. The best part to me about this dish though, besides the healthy serving of vegetables, is the crispy ginger garlic tofu…. Oh, and the next best part? It makes lots. So you’ll have leftovers for dinner later in the week when Thursday/Friday rolls around and you JUST. CAN’T when it comes to making supper…or lunches. The amount of leftovers will depend on how many people you have sitting around your table. If you don’t want to deal with all the leftovers, the recipe works perfectly fine when halved. Serve with a side of veggie spring rolls or have it without the side. No matter how you serve it, it’s going to be good. And will hopefully become a new favourite in your home. If you like this recipe, I think you’ll also like my Sweet Potato Broccoli Chickpea Bowls. 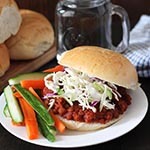 You can also click here for more delicious vegan dinner ideas! 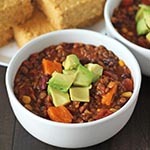 Looking for a quick weeknight dinner idea? 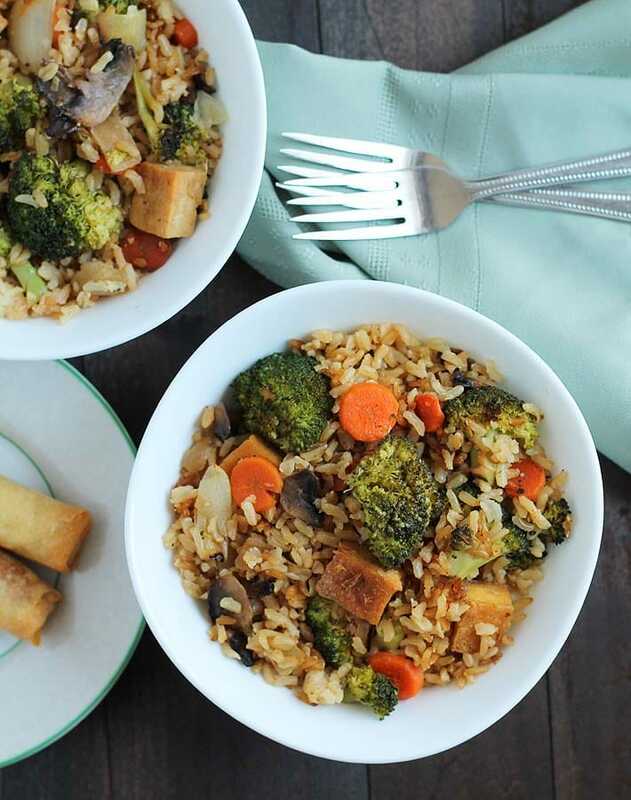 This Vegetable Fried Rice with Crispy Ginger Garlic Tofu is perfect, and you'll have leftovers for another dinner later in the week or lunches! Whisk together the pressed garlic, grated ginger and 2 tbsp of tamari or soy sauce. Set aside. Heat a large metal or cast-iron skillet over medium heat..
Once the skillet is hot, add 2 tbsp of oil and swirl to coat. 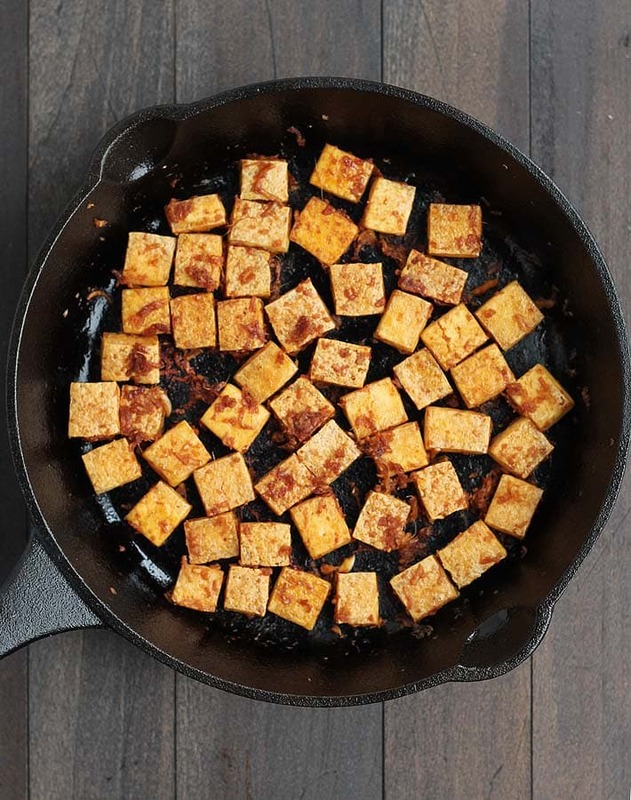 Place all pieces of tofu in the pan. Fry on 1 side for a few minutes or until golden brown. Once golden brown on 1 side, flip all of the pieces so the other side gets golden brown as well. Once both sides are crispy and golden brown, remove any excess oil from the pan and add the ginger/garlic/soy mixture. Mix around until all tofu pieces are coated. 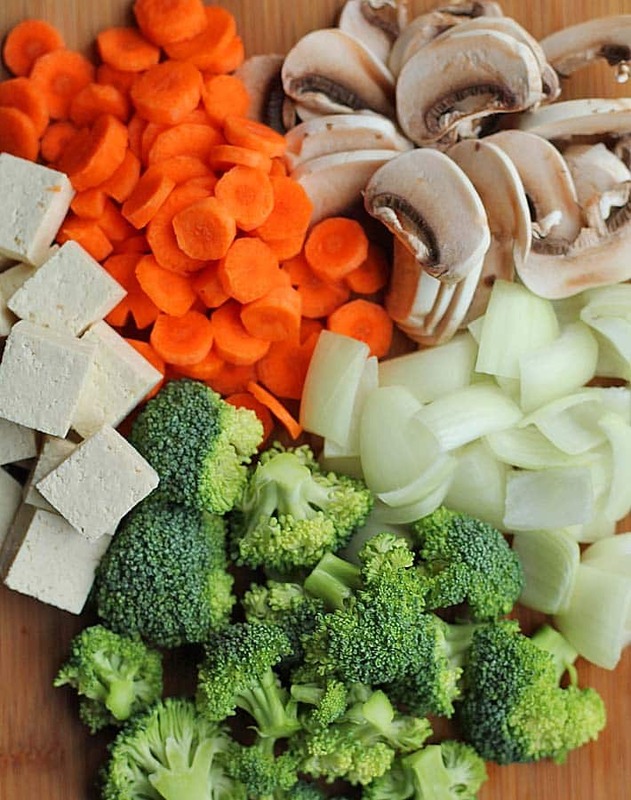 Remove tofu from skillet and place in a bowl. Set aside. Heat a large wok or pot on medium-high heat. Once it's hot, add 2 tbsp of oil and swirl to coat. Add the broccoli to the pot and stir fry for 2 minutes. Add the onion and stir fry for another 2 minutes. Add the carrots and mushrooms and cook for a few more minutes. Add the 4 tbsp of tamari or soy sauce and stir. Add the cooked brown rice and mix so everything is evenly coated. Add the crispy ginger garlic tofu. Mix again to evenly distribute the tofu pieces. I like to go a bit heavy on the garlic. Depending on how much garlic you prefer, you can use anywhere from 2-4 cloves. Your call! I made this on the weekend for lunches throughout the week, last week and it was perfect I love the tofu so much. THank you! Thank you for this quick & delicious recipe. 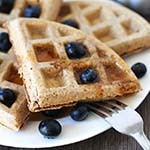 I have featured it on my FB site “Super Quick Plant-Based Recipes” facebook.com/SuperQuickPBRecipes/- where I like to share recipes that take only 20 minutes or less to prepare.